Our little miracle bunny is growing SO fast! Although her Dad, Doc, is almost 12 pounds and her Mom, Daisy almost 10, I guess it’s to be expected. Her ear furnishings are starting to be visible and even though she’s only 8 weeks old, she looks like the awkward teenager. Her amazingly soft fur goes off in every direction giving her a permanent “bed head” look. With the amount so far, I have high hopes for the softness and amount she’ll produce. I’m still so thankful that we have her. From a buck that we thought was sterile and then being a single baby from a first time Doe. I fully realize how amazingly lucky we are. She’s still with Mom, sharing a cage although I’m sure that she is fully weaned. She does a great job eating hay, alfalfa, oat grass, pellets and her favorite treat…oats. She doesn’t mind being held, picked up and LOVES to run around at full speed in the fiber studio. What a little joy to have! Rabbits, Dogs, Cats…Can a whole food chain live happily ever after? I think so. Sort of. I have to preface this with the fact that with only a few exceptions, I don’t leave the house with them all running together. But, while I’m home, it works well. Since the two house rabbits pre-date the cat, Noah has grown up around rabbits running loose. He’s used to hanging around the smaller house bunnies, but when the German Angora rabbits were introduced, he was a little more cautious. While Noah is a Ragdoll cat, which is not a small breed, the German Angora Rabbits are really large. Wisely Noah doesn’t try to play with them. Although he’s absolutely fine just hanging out with them. Bear came in at five months old, so not full size, but with a full size personality. Out of everyone, he is definitely the one in charge. Not only has the cat given up and walks away when bear decides to sit on him, but bear regularly chases even the dogs out of the room, nudging them until they get up and leave. Since the dogs were full grown and moved in only a few years ago, the fact that they learned to peacefully live with rabbits running loose still amazes me. Honestly, I think they just don’t know quite what they are or what to make of them. Except that they quickly figured out that these fuzzy, hopping creatures are wonderful Pez dispensers. And, if you watch them long enough, they will magically leave a coco-puff type treat. While not so popular with the humans in the room…it’s proven a favorite canine pastime to try to sneak one of these magic treats as the bunny hops away. Actually, it’s a pretty great way to spend the day, if the fiber studio watching them all interact. This is a subject that I apparently keep come back to. But, it’s an important one. I share a space with now…six wonderful rabbits and I’m one of those people that is sensitive to smells. Usually that doesn’t go well together. Honestly, I do clean cages and sweep up hay twice a day. So, there’s admittedly a lot of cleaning going on. But, I’ve gotten it down to a pretty quick process. Cooper and Emma are my original bunnies. They are rescue and a bonded pair. I’ve had Cooper for over eight years now. So he’s a pretty old man. They both live in the x-pen and use a litter box. Neither wanders out much since they aren’t as active as they used to be. I have pine shavings in their box and change it once to twice per day. Doc, Daisy and Lily live in Condo’s, which are very large cages. I think 36″. I can’t remember exactly…but plenty of room. I go between odorless, lightweight, low dust cat litter and pine shavings in the trays under their cages. I also use some lime in the area where each goes most. This makes cleanup really easy. Bear has his own large condo. He is very sensitive to smells. Pine shavings and kitty litter make him sneeze. So, I use a large puppy pad in his tray. I just wrap it up and toss it and replace with a new one. Not as cost effective, but easy and it work better for him. Since everyone gets run time every day I also have a lot of organic spray cleaner and shop type towels available. Running around they usually only have an accident (actually, they’re marking) near the other rabbits. So I expect that and it’s a quick clean-up. Okay, except for Bear. If he see’s me cleaning it up, he’ll get upset and really…and I mean really… spray. So I have to be a little more ninja in my cleanup. And, I leave the towel there so he is sure that his mark is still around, until he goes back into his condo. All of the cages get a deep cleaning once a week. You might be able to tell from the picture, the cages have removable hard plastic mats. 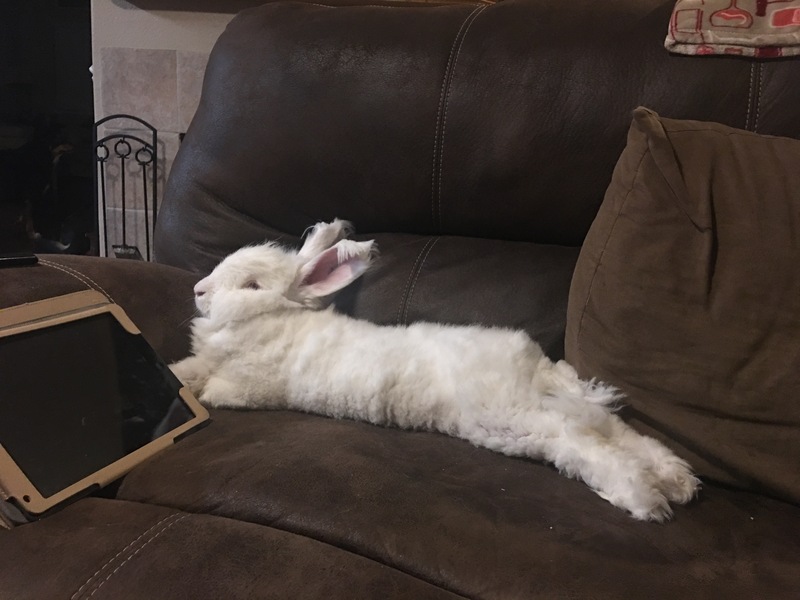 German Angora’s are heavy rabbits, and although I don’t trim the bottom of their feet (so that they have as much cushion as possible) I like having the extra protection of these liners. They don’t particularly like laying on them (I notice they lay in the area where the liners don’t quite reach), probably because it’s a little cooler with more air circulation under them, but I like the added protection they have on their paws. These get taken out and disinfected every week when the rest of the cage is wiped down. You can find them from Amazon here. I have the air cleaner running in the room as well. Honestly, I don’t know if it does much, but with that filter as dirty as it is, it must be cleaning something. The biggest challenge, really, is hay. Not that it smells, and I only sneeze during allergy season, but that stuff does seem to get everywhere and is not vacuum friendly. So, there’s a lot of sweeping going on. But, it’s a small price to pay for such sweet critters and the beautiful ‘wool’ that they produce. We’ve had a wonderful addition to our little rabbitry…Pooh Bear. Actually, he got his name from the CoCo puff trail that he leaves everywhere as he marks his territory, but Velcro because he is a complete Momma’s boy. This beautiful five month old came from Serendipity Angoras in Oregon. Rebecca is such a friendly, knowledgeable person and has a beautiful rabbits. German Angora with color seem are harder to find here in California, and while I love the white, I was anxious to add some color to the mix. This young tort buck was the perfect answer. He is not only handsome, he is full of energy…I mean really full of energy and absolutely loves to be with people. I have to admit, I’m not a fan of male puberty. And wow, can this little guy spray. I think the comment from my son was, “Geez, how does that much liquid get into one rabbit!” And the distance this guy can get has to be Olympic medal worthy. In one desperate moment I eventried a diaper for his free run time. He was not a fan and I gave up. Luckily as he’s getting a little older, he’s getting better. His fiber is just beautiful and I’m anxious to see how it spins up. Although, it’s now shearing time and I’m not looking forward to shearing this sweet bundle of energy! A wonderful Christmas surprise welcomed us. Daisy was actually pregnant and delivered one large, healthy and incredibly adorable baby! After several attempts and her thinking she was pregnant each time. I have to admit, I didn’t believe her this time. My comment to a friend was, “Yep, Daisy thinks that she’s pregnant again.” Well the joke was on me. Even though I was skeptical, I still kept an eye on the dates, albeit somewhat loosely. Day 31 she stopped eating, I have never known Daisy to miss a meal for any reason. That evening I reached in to pet her and talked to her…I got boxed….From sweet Daisy. This is so out of character that I was no thinking that this might actually be it. Checking on her every hour or so, sure enough at around 11pm on December 18th. A little, well, actually rather large, and very bald, pink baby was in the nest box. Just one. Of course the nerves set in with just one. Will it be warm enough? Will it get enough to eat? More than my share of worrying and more middle of the night “check-ins” than I’ll admit to. But, with luck, and Daisy being a GREAT mom, the little one is thriving wonderfully. Daisy is a fairly hands-on Mom and they are always snuggled up together. Now, at 4 1/2 weeks the little comes out to play, run and jump, loves alfalfa and oats and drinks from the water bowl like a champ. The perfect name is Lily…and it will be even more perfect if she’s a girl! Well, we continue to fight an infection on Doc’s right leg. A rabbit’s system is fantastic at walling off an infection. Unfortunately, this same tendency makes treating an infection very difficult. 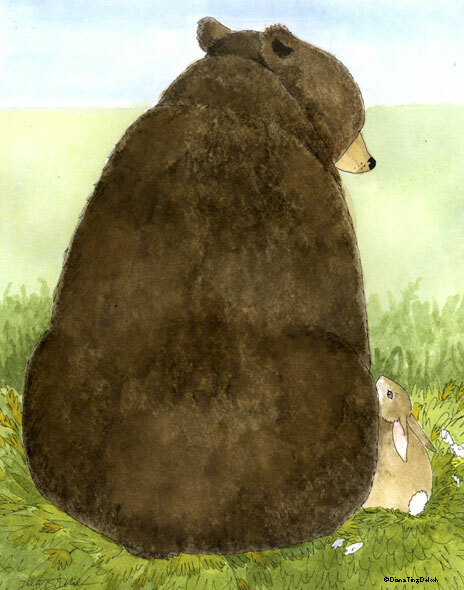 Sometimes a bunny is lucky and the antibiotics win, sometimes it’s a bear of a battle…this is one of those bears. 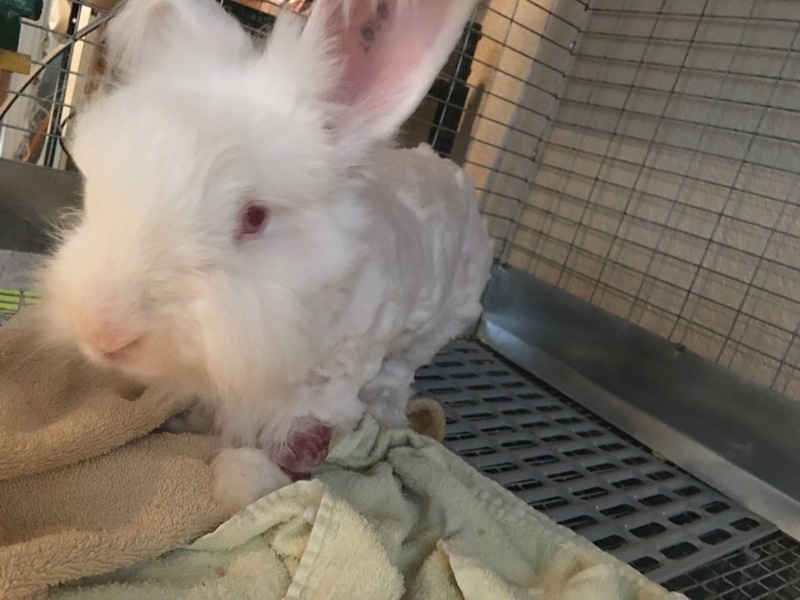 Even after a partial amputation of his foot (since the infection was in the bone), almost as soon as it healed, that stubborn infection moved up his leg. With the implantation of beads it looked like we were starting to get ahead of it, and I think we were, but now that sneaky thing has again moved up his leg. His leg is flushed daily and the beads are on order for yet another surgery to implant another set a little further up the leg. Luckily, we have sent in samples on two different occasions to find antibiotics that, at least in the lab, work. Although Doc hates the meds that he has to down ever 12 hours, the fact that he now has to travel with us if we go overnight everywhere has made him a bit of an ambassador for German Angora’s. It’s a good thing that he’s such a good traveler. Other than the infection he is sure a happy and healthy bunny that loves to be carried around and enjoy’s lap time. We’ll keep hoping that THIS time the procedure will kill of the infection for good! An indoor rabbitry has a few challenges. While it’s wonderful to be able to go in any time, spend time with the bunnies and free time is spend hoping around the bunny-proof rooms, it also has a unique set of challenges. The biggest…smells. As anyone with a rabbit can tell you, their urine smell is pretty hard to miss. And we’ve gone through quite a few options. to come up with…finally…a set-up that is working well. In addition to the two large German Angoras that live in their bunny condo’s. The two cottontails, Cooper & Emma have an x-pen and are litterbox trained. Since Cooper is 8-9 years old he doesn’t enjoy roaming around much anymore and prefers to just stay in his area. ; it’s really only Daisy and Doc, the two Angora’s that take turns running around the house. So, this leaves one litterbox and two big cages (and I mean really big cages) that need to be cleaned…and that can mean a lot of smell. It is known, or at least suspected, that high protein diets make the urine smell worse. Because the two angoras are fiber rabbits, they are on a high protein diet. Given the amazing amount of “wool” that they produce at each shearing, it sure seems to be working. They are fed Kings rabbit feed and supplemented with Dr Cheekes YQ. Pine Shavings: Very economical. I filled the litterbox and the tray of each of the cages. However, I found myself having to dump and replace all three twice a day. I bought a really large bag from the local feed store. While economical and very convenient, the smell was still way too much for indoors. PDZ Refresher/Sweet PDZ: I really had high hopes. It comes in a granular formula and in large bags for horse stalls. I was ready to be impressed…and… that was the closest I got to being impressed. Honestly, it simply wasn’t much better. Well, okay, I can’t honestly say that it’s working. But, I think it’s working. I ordered this air cleaner from Amazon. I’m going to say that it’s working. Actually, I think it is. I run this little guy 24/7 and the filter has picked up quite a bit of “stuff” and it certainly can’t be hurting. Lime: I sprinkle lime powder in the bottom tray of the cages. The litterbox doesn’t get any since I don’t think it would be safe for my elderly rabbits to jump around in. But for the bottom tray of the cages, it’s working VERY well. It’s a great helper to the main litter. I pick it up from the local feed store. Cage deep-cleaning: Once a week…well, okay, maybe a little less depending on my schedule, the cages get a deep cleaning. The flooring is pulled out and washed with bleach and water. The sides of the cage also get cleaned with a safer cleaning solution. I have heard that wood stove pellets in the tray absorb odor but I have yet to try this. It might be worth a try, but I’m not too optimistic that it cat beat cat litter. Between all of this you can’t even tell there’s a rabbitry in the house. And, given that it is in the same room as my fiber studio, it is really important to me that it smells great in there. Afterall, who wouldn’t want to spend as much time as they can in a fiber studio with fresh smelling, cuddly bunnies! For two weeks we gave medicines every 8 hours and flushed the open wound twice a day. Admittedly, Doc was not at all excited about any of it. But he has been quite the trooper. We’re just ending week three. The wound is completely healed, he’s off of his pain meds, and on the last round of antibiotics. I still have no idea what happened or what could have possibly caused it. Doc’s personality is back…and actually, sweeter than ever. He’s so used now to having all of this done that he is pretty calm about everything. He’s taken to sitting next to me when I’m spinning or weaving and LOVES hanging out on the ‘big’ chair. He’s a happy boy and we’re very lucky! While running the business, The Blissful Bear and running the rabbitry, Cottontail Farms simultaneously, they’ve shared a website, Slowly, as the rabbitry is growing, I’ve decided to separate them some. A little hectic, yes. But it makes sense. The Blissful Bear focuses more on crochet items, soaps and other fun items. Cottontail Farms’ main focus is the amazing German Angora rabbits, fiber and luxury yarns. They’re heading two different directions. And, as the rabbitry is expanding with Daisy expecting, I can better blog the fun happenings at the farm!